Current Affairs One Liner October 2nd week 2018. Current Affairs One Liner Questions. Current Affairs One Liner PDF. Weekly Current Affairs. Weekly Current Affairs One Liner. Current Affairs One Liner Questions PDF. 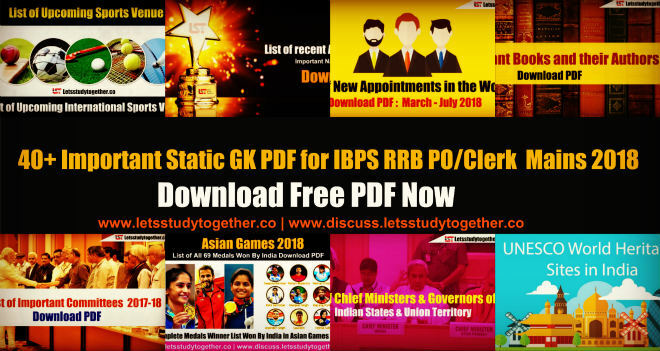 As we know it is time to gear up for IBPS PO Mains 2018 and to help you with Current Affairs, Banking & Financial Awareness and Static Awareness, Let’s Study Together (LST) Team are providing you the “250+ Weekly Current Affairs One Liner Questions” in PDF format from 8th October to 14th October 2018. Current Affairs & General Awareness section in banking and insurance examination plays an important role in getting final selection. Current Affairs & General Awareness Section will have questions with special reference to Banking Awareness and latest current affairs from the banking sector. It also includes questions from Static Awareness, Current Affairs (5-6 months) and Financial Awareness. This “Weekly Current Affairs One Liner Questions PDF” from 8th October to 14th October 2018 is also important for other banking exams such as IBPS Clerk, IB Assistant, SEBI, Canara Bank PO, SSC, IBPS SO, SBI SO and other competitive exams.